With that in mind, I’m trying to expand my horizons and try some of these crazy ideas out. I’m a wild woman, and this could provide a bit of fun. First attempt led me to Pinterest (where else?) and I found something called “Cauliflower Rice”. Cauliflower pulsed in a blender = rice? Thanks to StayFitMom.com for the inspiration! This is a thing? Apparently it’s so a thing, people are substituting cauliflower for all kinds of things. Well, if you can make it into rice, I can make fried rice! I pulled out my handy-dandy Ninja Professional blender and a head of cauliflower. I gave the cauliflower your basic chop and dumped the chunks into the blender jar. A few hits of the “pulse” button later, and presto! “Rice”! Well, that was easy. I don’t think I’d want to use a grater. Food processor/blender all the way, baby! Mama hates cooking and really only does it because I need to eat to live. What next? I scrambled a couple of eggs and then threw a frozen bag of mixed veggies into a skillet with some EVOO and this “rice”. Some soy sauce and cubed chicken made everything complete. 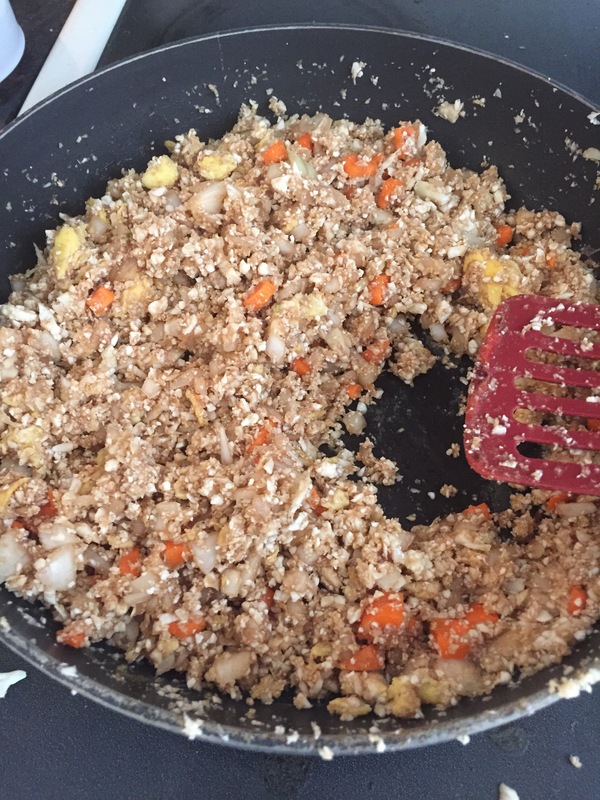 Yummy fried cauliflower rice made by ME! Here’s where it got interesting… The Doubter (AKA Caramon) felt the need to bless this food that it would “not kill us”. I’m not even kidding right now. Yeah, he managed to survive the night. Even with the questioning my sanity, none of this stuff remained. I’m not saying people licked the pan, but I do live with boys. Have you tried some of these vegetable fake-outs? I have never tried something like this, but this post makes me want to try. I wonder how the cauliflower “rice” would taste with some beans, corn, and salsa in a burrito. That’s a fantastic question! I believe I may have to try it… I wonder if I can sub in this with the cilantro to make a knock off Chipotle cilantro cauliflower rice?